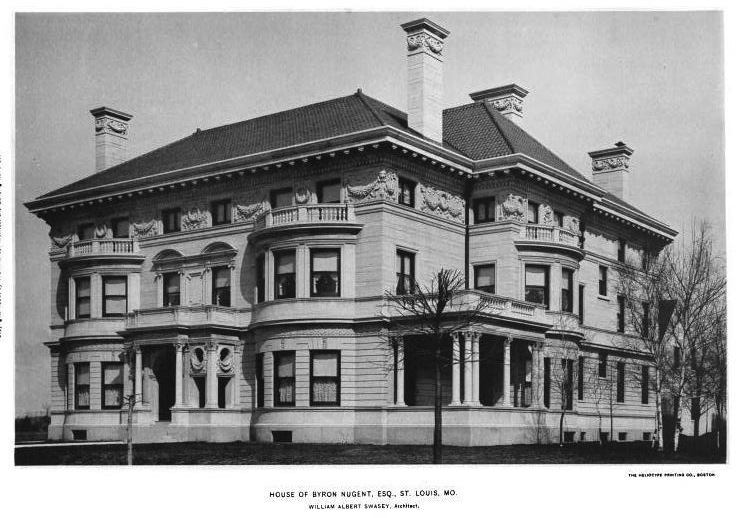 The Byron Nugent residence designed by William Albert Swasey c. 1895 in St. Louis, Missouri. Nugent headed B. Nugent & Bro. Dry Goods Co. which he ran with his brother Daniel Cline Nugent. Click HERE to see the Nugent residence on bing and HERE on google street view. Nugent house survives on St Louis's famed Westmoreland Place though altered Front doorway, porches and upper swags removed. Splendid home and amazingly it survives in one of those rare urban residential enclaves that appears to be remarkably intact over a century later. Very beautiful neighborhood full of grand architecturally diverse homes. Why would anyone change a thing about this home!! Nice it still stands, but sadly not the same as the original. This was my grandmother's residence when she was a girl growing up in St. Louis. I have never seen the house except in pictures. It is nice to read that the house is still in tact. Maybe someday I can visit it. Actually I just referred back to a book called Kingsbury Place, authored by Julius Hunter, and if this gentleman's information is correct my great grandparents house was torn down in 1938....and according to the pictures in his book this is not my great grandparents house. was the most magnificent home on that street (homes just generally a notch beneath the palaces on Westmoreland Pl.) Nugent's was once one of the big 3 department stores in downtown St. Louis, and the 1st to go out of business. Go to Bellefontaine Cemetery website and check out the "ecims" cemetery guide and you can see the burials in the family mausoleum. The mausoleum once had a genuine Tiffany art glass window that was stolen way back in the 1960s, one of the 1st (of the now all too frequent) architectural thefts from this magnificent cemetery. The house has been severely altered inside and outside. The chimneys were cut below the swags, all the swags and wreaths on the third floor were removed, as was the frieze between the first and second floors. The porte cochere was removed and replaced with a cheap iron replacement, and the east sun room was also removed. The grand staircase sat in a by in the back, with stained glass all the way form the middle of the first floor to the top of the third. The staircase started as two, went to a landing, and then to the second floor as one. There it repeated the same pattern all the way to the third floor. This entire staircase was removed and the stain glass was covered. A 1940's style curving staircase was placed which only went to the second floor. The third floor ballroom can now be accessed only through a small staircase. It's a shame what the Gaylord's did to this beautiful house around 1940.